A great sampler of the best writing from emerging writers in the Northern Territory. Featuring earlier versions of two of my stories: ‘Elijah Upjohn, public hangman’ and ‘The uncoupling of Eduardo Martinez’. 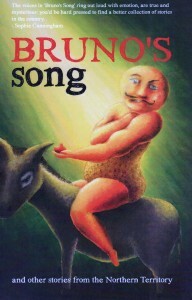 The voices of Bruno’s Song ring out loud with emotion, are true and mysterious: you’d be hard pressed to find a better collection of stories in the country.